سابق الفرس إلی الإسلام صحب النبي صلی الله عليه وسلم و خدمه و حدث عنه. According to Bernard Lewis: “[Arab Muslims conquests] have been variously seen in Iran: by some as a blessing, the advent of the true faith, the end of the age of ignorance and heathenism; by others as a humiliating national defeat, the conquest and subjugation of the country by foreign invaders. Both perceptions are of course valid, depending on one’s angle of vision… Iran was indeed Islamized, but it was not Arabized. Persians remained Persians…… the Iranian contribution to this new Islamic civilization is of immense importance. The work of Iranians can be seen in every field of cultural endeavor, including Arabic poetry, to which poets of Iranian origin composing their poems in Arabic made a very significant contribution. In a sense. 1) Salman Al-Farsi رضي الله عنه – A Major Sahabi, well known, may Allah be pleased with him. صفاته: كان من أجلاء الصحابة , بطلا مغوارا, من الشجعان المعدودين في الصحابة, ومع ذلك كان متواضعا منقادا للحق. وكان عاقلا حازما رضي الله عنه وعن جميع الصحابة والتابعين. اللهم اخذل من لعنهم وسبهم. Al-Daylami was the brave Sahabi who killed the false Prophet “Al-Aswad Al-Unsi” (acc. to Ibn Taimiyyah). The Prophet praised him for that. 3) Salem the Mawla of Hudhayfah رضي الله عنهما – A Persian Sahabi, who was from The foremost, the first of the emigrants, a Badri, one of the first Sahaba. He accepted Islam before Salman Al-Farsi, for Salman accepted Islam in Madinah (did not witness the Makkan period at all). He was a highly respected and valued Muslim (among his fellow Muslims), who died while fighting against the forces of Musaylimah during the Wars of Apostasy. There are some interesting narrations exposing the lies of one coin with two sides, the Rafidite Shi’ite clergy and the Islamophobic-Neo-Sassanid Iranian fashists, who both hold deep grudge for Omar Ibn Al-Khattab (Allah is well pleased with him) and both accuse him of being anti-Persian. They both do that by citing either weak/forged narrations or some narrations where they intentionally don’t mention the context. Like many sayings of Omar (Allah is pleased with him) in regards to the Persians were not directed at the Persian race, rather the Persians back then stand for the Sassanid’s, the tyrants who (before the Arabs!) attacked many Arab lands, even Yemen the motherland of the Arabs was ruled by a Persian king. Hence the Persians were viewed as a threat, and in fact history proofs that the Sassanids, especially in the later stage were not just enemies to their neighbours, but even to the Persians themselves who suffered from the caste division of the Sassanid nation that was backed by the corrupt priests of the Zoroastrians. The point is, there is not a single authentic narration where Omar or any companion of the Prophet (peace be upon him) condemns the Persian race, and ironically there are narrations that Islamophobic Iranians and the Shia clergy never mention, among them narrations where Omar Ibn Al-Khattab praised Persian companions of the Prophet, made a Persian the new Wazir (basically the new King) of Persia (Omar during his Caliphate appointed Salman the Persian as the knew Wazir of Al-Mada’en the former capital of Persia) and he and the major companions of the Prophet (صل الله عليه و على آله و سلم) used to pray behind a Persian and this alone destroys the fairy tales and lies of the Shia clergy (who quote forged narrations) where Omar apparently prevented Persians to pray in the first line of the Prophet’s Mosque. This Sahabi, who was the master of the Qur’aa (Qur’an recitors) amongst the biggest Sahabah was no one less than Salem the Persian from “Estakhr” (a city, still located in the FARS/PERSIA province of south Iran). Doesn’t sound really “Anti-Persian”, does it? This was the SON of Omar Ibn Al-Khattab, and not just him, but basically the BEST companions of the Prophet used to pray behind a Persian because he could recite the Qur’an best! الواقدي : حدثنا أفلح بن سعيد ، عن محمد بن كعب القرظي قال : كان سالم يؤم المهاجرين بقباء ، فيهم عمر قبل أن يقدم رسول الله -صلى الله عليه وسلم- . There are are also narrations were the Prophet paid his homage and utmost respect and love to Salem the A’jami (Persian). حنظلة بن أبي سفيان : عن عبد الرحمن بن سابط ، عن عائشة قالت : استبطأني رسول الله ذات ليلة ، فقال : ما حبسك ؟ قلت : إن في المسجد لأحسن من سمعت صوتا بالقرآن ، فأخذ رداءه ، وخرج يسمعه ، فإذا هو سالم مولى أبي حذيفة ، فقال : الحمد لله الذي جعل في أمتي مثلك إسناده جيد . ^This narrations has been narrated by the Mother of the Believers ‘Aaisha who says that the Prophet صل الله عليه و سلم thanked Allah for having the likes of Salem in his Ummah. Omar ibn al-Khattāb suggested he would have designated Salim as his successor to the Caliphate had he still been alive. 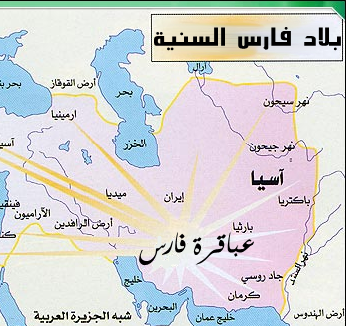 (Omar appointed Salman the Persian of the then capital of Persia “Al-Madain” i.e. he was practically the new king Persia, and Omar also wanted a Persian to be the Khalifa of the Muslim Ummah, yet some try to portray him as “Anti-Persian”). He had contributed in all major battles, such as Badr, Uhud, Ahzab etc., so he is the Badrian companion of the Prophet Muhammad (Peace be up on him). أخبرنا الإمام أبو محمد عبد الرحمن بن محمد في كتابه ، وجماعة ، قالوا : أخبرنا حنبل بن عبد الله ، أنبأنا هبة الله بن محمد ، أنبأنا أبو علي بن المذهب ، أنبأنا أحمد بن جعفر ، حدثنا عبد الله بن أحمد ، حدثني أبي ، حدثنا عفان ، حدثنا حماد ، عن علي بن زيد ، عن أبي رافع أن عمر بن الخطاب قال : من أدرك وفاتي من سبي العرب فهو من مال الله . فقال سعيد بن زيد : أما إنك لو أشرت برجل من المسلمين ، لائتمنك الناس ، وقد فعل ذلك أبو بكر الصديق ، وائتمنه الناس ، فقال : قد رأيت من أصحابي حرصا سيئا ، وإني جاعل هذا الأمر إلى هؤلاء النفر الستة . ثم قال : لو أدركني أحد رجلين ، ثم جعلت إليه الأمر لوثقت به : سالم مولى أبي حذيفة، وأبو عبيدة ابن الجراح . علي بن زيد لين فإن صح هذا ، فهو دال على جلالة هذين في نفس عمر ، وذلك على أنه يجوز الإمامة في غير القرشي ، والله أعلم . […] Omar Ibn Al-Khattab said: “whoever accompanied my death from a captive of the Arabs then he is from property of Allah.” Then Saeed Ibn Zayd said: “Uou, if u appointed from the Muslims a man, the people will trust you, Abu bakr did it and the people trusted him.” Then Omar said: “I seen from my companions a bad avarice, surely i make this matter (Caliphate) with six individuals of this group, then he said that if one of two people would accompany me , then i make this matter to him , I would select it for him: Salim Mawla Ibn Abu Hudhayfa and ‘Ubaydallah Ibn Al-Jarrah”. 4) Munabbih ibn Kamil ibn Sirajud-Din Dhee Kibaar Abu-Abdullah al-Yamani al-San’ani was a companion. He was a Persian knight, and was married to a Himyarite. He had two children, Wahb ibn Munabbih and Hammam ibn Munabbih.He came from Haraah, Khorasan in Persia to Yemen. 5) Abu Abdurrahman, Mehran Ibn Farakh, the close friend & servant of the Messenger of Allah صل الله عليه و سلم (he used to be the servant of Umm Salamah). From the “Abna Fares” (Sons of Persia, this is how the Persians were called who used to live in Yemen). He had many nicknames, one is “Safinah” (the Ship), which was givin to him by the Prophet peace be upon him (he is referred normally by that name in Ahadith). 1. Hafidh Al-Hadith Abu Hatim Al-Razi (Persian from Isfahan). قال الإمام الذهبي : كان مِن بُحُور العِلم، طوَّفَ البلاد، وبرع في المَتن والإِسناد، وجمعَ وصَنَّفَ، وجَرَح وعَدَّلَ، وصَحَّحَ وعَلَّل. He was an ocean of knowledge …. and excelled in Mutun (Text) and Isnad (chain of narrations i.e. a Master of Hadith science) …. 2. Imam Al-Tirmidhi (Persian from Khorasan, town of “Tirmiz” which is part of what is called today “Uzbekistan”. He wrote al-Jāmi‛ al-ṣaḥīḥ, popularly called Sunan al-Tirmidhi, one of the six canonical hadith compilations. 4. Imam Al-Hakim Al-Nisabouri (Persian from Nisabour/Khorasan in today’s north-east Iran). 5. Imam Abu Jafar Mohammad ibn Jarir Al-Tabari (Persian from Tabaristan, todays Mazandaran/north Iran). He was a Mujtahid, historian and major Mufassir. His Tafsir “Jāmi` al-bayān `an ta’wīl āy al-Qur’ān, popularly Tafsīr al-Ṭabarī” is regarded as one of the best Tafasir ever. No Muslim household can afford to lack his Tafsir, let alone the Muslim scholars around the world. 6. Al-Allamah ibn Fares Al-Loghawi (Persian from the city of Qazwin/Iran). He was a poet, Faqih, Mufassir and Master of the Arabic language. He is known as “Ibn Fares” (Son of Persia). وكان من رُؤوس أَهل السُّنَّة المُجرَّدين على مذهب أَهل الحديث… وتخَرَّج به أَئمّة. 8. Abu Bakr Ahmad ibn Husayn Ibn ‘Ali Ibn Moussa al-Khosrojerdi al-Bayhaqi, البيهقي also known as Imam Al-Bayhaqi was a Persian Sunni scholar born 994 CE/384AH in the small town of Khusraugird near Bayhaq in Khurasan. 9. Abu Muhammad Abdal Qadir al-Gilani (Persian Sunni scholar from north Iran/Gilan). 10. Al-Imam Nafi Al-Madani (Persian from the city of Isfahan who settled in Madinah and became the IMAM of the people of Madinah). Nafi` ibn `Abd al-Rahman, d. 169 H in Madina, the qari’ from who the two recitations of Warsh and Qalun (from the 7 Qira’at) branched off. Note: the Qur’an is revealed in seven SAHIH Ahruf (singular harf), Nafi the Isfahani Persian narrated TWO Qira’at (Warsh and Qalun), Abdullah Ibn Kathir al-Makki the Persian Imam of the QUR’AN RECITORS of MAKKAH who transmitted the readers (Harf) of Al-Buzzi and Qunbul, Al-Kisa’i Al-Kufi (of Persian origin) who transmitted the readers of Al-Layth and Hafs Al-Duri and Hamza Al-Kufi who also was of Persian origin, he transmitted the readers of Al-Khallaf and Al-Khallad. So all in all, FOUR of the seven most authentic Ahruf were transmitted by Persian Tabi’een. 11. Ikrama Mawla ibn Abbas. (one of the MAJOR Tabi’in and student of Ibn Abbas). يقول عيينة: سبق الأعمش أصحابه بأربع خصال: كان أقرأهم للقرآن، وأحفظهم للحديث، وأعلمهم بالفرائض. قال الذهبي: كان رأسا في العلم النافع والعمل الصالح. Tawos the Persian was a giant among the Tabi’is (Salaf) and a student of the Sahabi Abdullah Ibn Abbas رضي الله عنهما . It is not known from which Persian town he was from, but what is known is that he was Persian from Fars (Heartland of Persia). قال ابن عباس: إني لأظن طاووسًا من أهل الجنة. “I think that Tawoos will be from the people of Paradise”. 15. Al-Nasā’i. full name Aḥmad ibn Shu`ayb ibn Alī ibn Sīnān Abū `Abd ar-Raḥmān al-Nasā’ī. A Persian from Khorasan. His book known as Sunan Al-Nisai which is taught around the globe in every Islamic institute and which possesses a virtue of being one of the Sihah Sitah (the six books generally taught in hadith). 16. Nuʿmān ibn Thābit ibn Zuṭā ibn Marzubān (Persian/Arabic:نعمان بن ثابت بن زوطا بن مرزبان), better known as Imam Abū Ḥanīfah, (699 — 767 CE / 80 — 148 AH) – He was a Persian, his family were originally Persians from Kabul, todays capital of Afghanistan. His ancestry is generally accepted as being of non-Arab origin as suggested by the etymology of the names of his grandfather (Zuta) and great-grandfather (Mah). The historian, Al-Khatib al-Baghdadi, records a statement from Abu Hanifa’s grandson, Ismail bin Hammad, who gave Abu Hanifa’s lineage as Thabit bin Numan bin Marzban and claiming to be of Persian origin. The discrepancy in the names, as given by Ismail of Abu Hanifa’s grandfather and great-grandfather are thought to be due to Zuta’s adoption of the Arabic name (Numan) upon his acceptance of Islam and that Mah and Marzban were titles or official designations in Persia, with the later meaning a margrave refers to the noble ancestry of Abu Hanifa’s family as the Sasanian margraves of Kabul. Those stories maintain for his ancestors having been slaves purchased by some Arab benefactor are, therefore, untenable and seemingly fabricated. The widely accepted opinion, however, is that he was of Persian ancestry. 17. Muhammad Ibn Ismail Ibn Ibrahim Ibn al-Mughirah Ibn Bardizbah IMAM al-Bukhari (Persian/Arabic: محمد بن اسماعيل بن ابراهيم بن مغيره بن بردزبه بخاری), popularly known as Bukhari or Imam Bukhari, (196-256AH / 810-870AD), was a Sunni Islamic scholar of Persia. He authored the hadith collection named Sahih Bukhari, the most authentic of all hadith compilations. His Persian Grandfather was a Majoosi and died upon Majoosism. His father converted to Islam. Imam Al-Bukhari was Persian from Khorasa/Bukhara which is today located in Uzbekistan. 18. Abul Husayn IMAM Muslim ibn al-Hajjaj ibn Muslim ibn Warat al-Qushayri al-Nishaburi (Arabic: أبو الحسين مسلم بن الحجاج القشيري النيشابوري‎; Persian: مسلم نیشابوری; lived c. 206–261 AH/c.821-875 CE) was the author of the second authentic sahih collection of hadith, Sahih Muslim. He was not a Persian, rather an Arab of the Qushayri tribe, but as Ibn Al-Khaldoon said: “Most scholars of the Sunnah were either Persians OR they have been brought up in Persia. Imam Muslim has been brought up in Persia, in fact he was a Nishaburi (a city still located in the Khorasan part of Iran). He was born and raised in Persia/Khorasan (town of Nisabur), he was of Arab origin, from the Qushayri tribe. 19. Abū ʻAbdillāh Muḥammad ibn Yazīd Ibn Mājah al-Rabʻī al-Qazwīnī (Arabic: ابو عبد الله محمد بن يزيد بن ماجه الربعي القزويني‎), (824 CE/209 AM—887/273) commonly known as Ibn Mājah, was a medieval scholar of hadith. He compiled the last of Sunni Islam‘s six canonical hadith collections, Sunan Ibn Mājah. He was of Arab origin from Qazwin. اشتهرت مدينة قزوين في فن الحديث منذ القرن الثالث الهجري، وكان يعيش فيها كثير من المحدثين؛ لذلك سموا هذه المدينة بـ « باب الجنة ». وهناك كثير من المحدثين والفقهاء الذين عاشوا في قزوين ونيّروا بأسمائهم صفحات مجيدة من تاريخ فارس. 20. Abu Dawood Sulayman ibn Ash`ath Azdi Sijistani (Persian/Arabic: ابو داود سليمان بن اشعث السجستاني), commonly known as Abu Dawud, was a noted Persian (of Arab origin) collector of prophetic hadith, and wrote the third of the six canonical hadith collections recognized by Sunni Muslims, Sunan Abu Dawood. He was born in Sistan, in east of Iran, (then Persia) and died in 889 in Basra. Abu Ya’la Al-Qazwini (north-west Iran) Al-Hanbali, Abu Na’im Al-Isfahani the Persian (one of the biggest Sunnah scholars ever, who wrote an extensive rebuttal of the Rafidah sect under the name: الإمامة والرد على الرافضة ), Ibn Khuzaymah Al-Nisaburi, Fakhr Al-Din Al-Razi (from Persia/Amol), Sarkhasi, Abu Hamid Al-Toosi (todays Mashad), Farabi, Abu Ali Al-Farsi (Master of the arabic language), Imam Dawod Ibn Ali Al-Isfahani also known as Abu Sulayman the FOUNDER of the Zahiri Madhab, Abu Naim Al-Isfahani, Yahya Ibn Wathab, Ibn Al-Mundhir Al-Nisaburi, Shahab Al-Deen Ahmad Ibn Hussein known as Abu Shuja’, a big Shafi’i scholar from Persia/Isfahan, Abul-Qasim Al-Rafi’i Al-Qazwini (Persian Shafi’i scholar from Qazwin), Imam Baghawi (with the notorious Tafsir Al-Baghawi), Imam Wahed (Tafsir Wahed), Ibn Marawiyah Al-Isfahani, Abdullah Ibn Omar Baydhawi (Tafsir Baydhawi), the two major Tabi’een of Iraq, Hassan Al-Basri and Ibn Sireen who both were of Persian origin, Imam Thalabi, known for his Tafsir Thalabi, Abdul-Karim Shahrestani (Khorasani) known for his masterpiece called:”Al-Melal wa Al-Nahl”, Abu Bakr Ibn Abdurrahman Al-Jorjani (from Gorgan/Persia), a schlar of Sarf and Nahu (Arabic Grammer), Imam Al-Suyuti the Egyptian of Persian origin, Imam Layth bin Sa’ad the famous jurist and founder of the Layth Madhab in Egypt who was of Persians origin from Isfahan, Abu Ishaq Al-Shiraz (Persian from Shiraz), one of the biggest Shafi’i scholars ever, Firozabadi, another major Shafi’is scholar, Imam Al-Haramayn Abdul-Malik Al-Juwayni, Imam Al-Tabarani, Nafi` the Mawla of Ibn `Umar [most likely a Persian according to al-Dhahabi], Junayd Al-Baghdadi the Persian … etc etc. طبقات المحدثين باصبهان والواردين عليها (The scholars of Isfahan/Isbahan), solely to collect all the names of the Sunnah scholars from Persia/Isfahan, for they used to be in such a massive number, that scholars considered it beneficial to write books just about the details of Isfahani scholars. Almost no Aqidah/Fiqh/Hadith book can be found without mentioning one of the thousands of giant Isfahani-Shirazi-Rai (old name for Tehran), Toos/Khorasan Sunnah scholars. And what we’ve mentioned is like a drop in the ocean, there are many more, and in fact the Persians always used to be Shafi’is and some were Hanafis, and these schools are based upon the works of Persian Sunnah scholars, in fact the major scholars of Islam and many major Tabi’in, even some Sahaba were Persians. So Sunnah belongs to Iran, just like it belongs to other Muslims lands, maybe even more. NOTE: Mawla does not mean SLAVE. Slave in arabic means “‘Abd”. Mawla is a close friend AND servant and most Mawla’s back then were PERSIANS. Thus Mawla = Persian. (O people, your God is only one and your father [Adam] is one, NO preference to an Arabian for a non-Arabian, or to a red-colored for a black-colored , preference is only by Taqwa (PIETY). 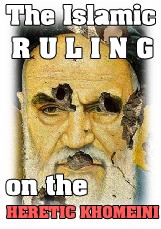 This entry was posted in Sunni Persia's service to Islam. Bookmark the permalink.